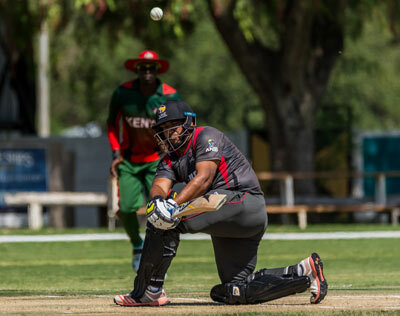 Day one of the World Cricket League Division Two tournament in Windhoek, Namibia saw one low scoring thriller and two blow-out games as Nepal, Canada and the UAE all recorded wins as they bid to reach the World Cup Qualifier in Zimbabwe next month. At Affies Park, Nepal captain Paras Khadka won the toss and chose to put hosts Namibia in to bat. They made inroads in the first over, with Sompal Kami bowling the often dangerous Louis van der Westhuizen from the fifth ball of the match, before having Stephan Baard caught behind in the fifth over. The third wicket put on 52 between three batsmen - Zane Green having retired hurt - before Basant Regmi removed JP Kotze. Craig Williams was the next man out with the score on 80, having scored 41. Runs began to dry up for the home team, with the wicket of Williams followed by three consecutive maidens, Gerhard Erasmus being bowled by Khadka from the last ball of the 16th over. The next over saw recent IPL signee Sandeep Lamichhane trap Sarel Burger lbw for a golden duck and Namibia had lost three wickets for just one run. Lamichhane took two more wickets to finish with figures of 4-18 as Namibia were bowled out for just 138. Nepal though have form when it comes to chasing apparently simple targets, and so it proved again as they struggled in the first half of their innings, only reaching 56 in the 24th over when Karan KC was the sixth man out. Sharad Vesawkar helped get them back in to the game with an innings of 29, but at 104-8, things were looking bleak for the visitors, especially when rain came with the score on 111 and Nepal behind on DLS. On resumption, though they did have Sompal Kami - holder of the record for highest T20I score by a number 10 - at the crease, and he helped them get to 121 when he was the ninth wicket to fall. Nepal fans following the game were still on the edge of their seat though as Basant Regmi and Sandeep Lamichhane inched towards the required total. They entered the penultimate over needing 16, Lamichhane played out dots from the first two balls, before getting Regmi on strike after a quick single. Regmi then got the runs required to single figures when he hit Sarel Burger over long-off for six, Burger following it up with a wide. Regmi took a quick single from the fifth ball of the over, with Lamichhane able to keep the final ball of the over out to get Regmi back on strike for the final over. Seven needed from the last, and Regmi managed two from the first ball of the over, then brought the scores level with a four to third man. A leg-side wide to win the game was tad anti-climactic, but Nepal breathed a very big sight of relief as they celebrated their one wicket win. Over at the United Club ground, Oman, looking for a fourth consecutive promotion, were batting first after Canadian captain Nitish Kumar won the toss. Both Omani openers were dismissed cheaply, and only three of their batting line-up were even able to reach double figures. Aqib Ilyas top scored with 46 as Oman were bowled out for 106. Nikhil Dutta was the pick of the Canadian bowlers with 3-11. 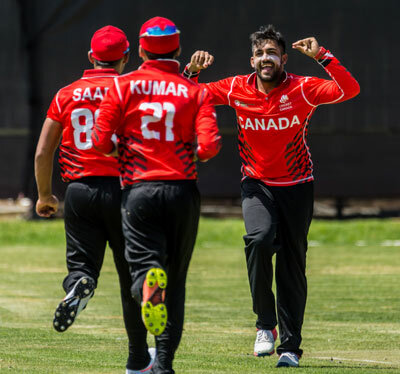 Canada lost Bhavindu Adhihetty for a duck in the first over of their reply, but otherwise had little trouble, securing an eight wicket win in 15.4 overs to give their net run rate a boost. Nitish Kumar top scored with an unbeaten 53, whilst Ruvindu Gunasekera scored 46. At the Wanderers ground, Kenya won the toss and also chose to put their opponents into bat. The United Arab Emirates, looking to avoid losing their ODI status, started with Rohan Mustafa and Ashfaq Ahmed putting on 133 for the first wicket before Ahmed was out for 73. Mustafa also reached 73 before he was the third man out with the score just shy of 200. Rameez Shahzad was the third UAE batsmen to record a half-century, scoring 63 before he was bowled by Nelson Odhiambo. A quick unbeaten 46 from 38 balls by Muhammad Usman helped the UAE post 309-8 from their 50 overs. No batsmen was able to get a start for Kenya, with Rushab Patel's 17 the top score. They were only able to score 91, losing by 218 runs. The UAE shared the wickets around, with four bowlers each taking two wickets. The tournament continues tomorrow, with hosts Namibia playing Kenya, Nepal taking on Oman and Canada coming up against the UAE.